Trento is located in the Adige Valley and does not have a major airport. The closest airports are Verona (1 hour by car), Venice (2.5 hours by car) and Innsbruck (2.5 hours by train). Further away are Milan (3 hours) and Munich (5 hours by car). It is possible to rent a car at the Italian airports and leave the car in Trento (notably Sixt has done this, not sure about other rental agencies), but most students arrive by train. Verona (approx 60 miles) is the closest airport for Trento, though not all major airlines fly directly into Verona. There is a shuttle bus that connects the airport to the train station. Once on the train, it takes approximately 1 hour. Trains are fairly frequent. Venice (approx 120 miles) does handle many international flights from the US and Asia. There is a shuttle from the airport to the train station. The train trip is about two hours not counting a change in Verona. The wait between trains can be 5 minutes but frequently is around an hour. There is also a local train that goes through and requires a change in Bassano di Grappa. This may be cheaper. Innsbruck (approx. 150 miles) takes connecting flights from international airports. This is a small airport however and connecting services are not as frequent as Venice or Verona. There is a train from Innsbruck to Trento, about 2.5 hours. You have to bus or taxi from the airport to the train station (note: the airport website says that train is available but not having taken it, we cannot confirm if this train exists. The EasyJet site, for example, does not mention trains at last check). Munich (approx 200 miles) handles all major airlines and has links to an express train that stops in Trento - but still figure 5 hours not counting the airport wait. Usually one or two people take this route and so far all have lived to talk about it. Milan (approx 180 miles) has three airports (including Bergamo with different difficulty levels in reaching the train system from the airport. Once on the train, it is about 3 hours for an express and possible more if changing is required in Verona. There are some other airports in between the major ones such as Brescia or Bolzano. Train service would be shorter but connecting flights are difficult to find and no information is given on these choices. Foreign travelers need to know that train tickets must be stamped at the station before getting on the train. The stamp is just a date and time stamp that effectively prevents the rider from using the ticket for any other journey that seems unreasonable given the date and time stamp. The machines are little boxes about the size of a shoe box and are mounted on the platforms. If by some chance you forget to stamp your ticket and the conductor is coming, using a pen, write the time and date on one end of the ticket. It may get you out of a fine. Villa Madruzzo is located to the east of Trento on one of the small slopes that surrounds the city. It is about a 45 minute walk downhill to Trento. It is rather longer in the other direction. 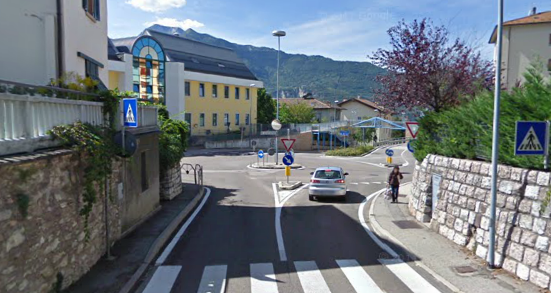 However, sidewalks are hit or miss in Trento and buses or taxis are suggested. 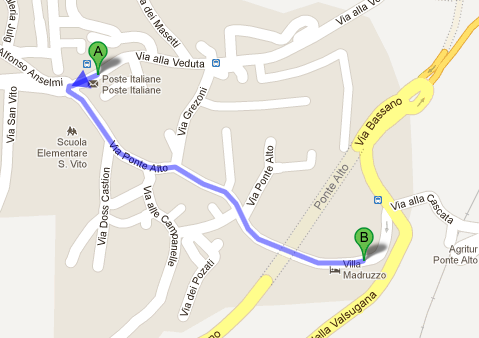 A quick note: There are two bus routes that run from Trento to near Villa Madruzzo and back. The hotel recommends the number 9 on their website even though the stop is a bit further to walk to. This is an urban bus and uses a different ticket than the extra-urban line. The extraurban buses, on the other hand, are closer and so a quicker route to Trento but those buses do not travel as frequently since they are extra-urban lines. The ticket for these can be purchased on the bus (according to the hotel last year but I am not promising this!). 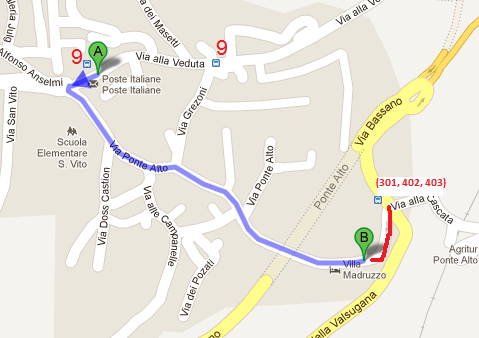 To get to the this stop, follow the route in red in the following map: exit the hotel and turn right, going downhill. The stop is at the first intersection. However, be warned that this information about extra urban may be outdated as things have changed recently. Directions for the number 9 stop are given in further detail below. Assuming arrival at the main train station, the directions by bus are easy according to the hotel: take the number Nine bus and get off at the stop called 'Scuole' - which means "School". Sticking with the 'easy' theory of the hotel for a moment: tickets for the buses are available in the station of course and in general at any place with a large black 'T' (which means Tobacco shop) or some newstands. Once on the bus, the rider is required to validate the ticket by sticking it in a machine that writes the date and time on the ticket. Once stamped, the ticket is good only for 70 minutes ( I think ). Ok, so now you are on the number 9 bus and going up the hill to the hotel. How to know what stop to get off at? The best way is to talk to the driver. No Italian is necessary, just say 'Villa Madruzzo?' at each stop. Or if you prefer 'Ciao signore, qui è Villa Madruzzo?' (Chow, seen_or_ay, kwee ay Villa Madruzzo?). The drivers are all nice and will tell you the stop. Then, however, there is about a 800 yard walk to the hotel. It is one of those deals where it is easy to get to if you know where to go. Signs in Italy are also hit and miss. Streets are usually indicated on the sides of buildings rather than on poles in intersections. However, this is mostly true for the cities and signs are skipped a lot elsewhere. Hang a sharp left. (by car this would mean traveling 270 degrees around the traffic circle and then making a right). This road is called 'Ponte Alto' which means 'High Bridge' in Italian as the road ends in a bridge over a canyon of sorts. There is also a lower bridge over the same canyon, in case you wondered. In order to get to Villa Madruzzo, follow 'Ponte Alto' for quite some distance (best guess 800 yards, but I've never walked it). After this distance, on the right will be a sort of low castle wall. Just before this wall is the entrance to Villa Madruzzo. (You can continue on the Ponte Alto if you wish to come in the front, however you will have to go down a hill and then go back up the same hill to get to the same spot as the back entrance takes you).